Making a cabin fit its special site can mean altering a company's stock plans or creating a plan from scratch. That kind of flexibility is common with log construction. 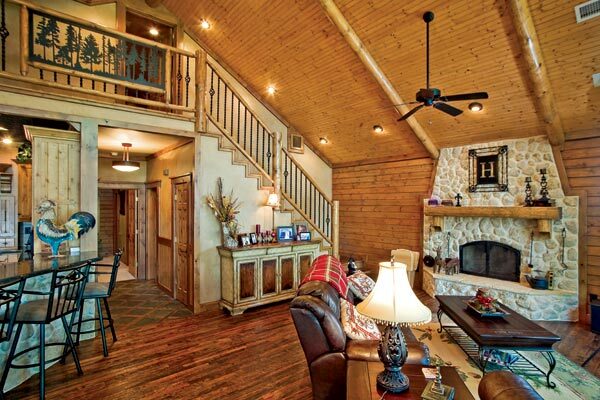 A log cabin is a dream home, not an ordinary house. Often cabins are built on special pieces of property — like this lakefront lot. The cabin's traditional outside appearance disguises the wide open spaces within. The porch wraps around three sides of the lakefront home and leads to cascading decks. 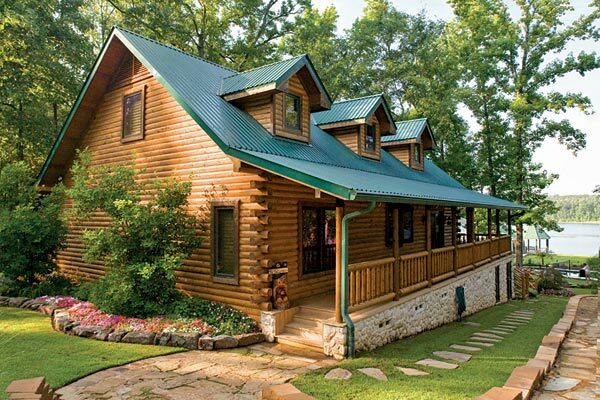 Making a cabin fit its special site can mean altering a log home company’s stock plans or creating a plan from scratch. "Custom work at low cost is a Satterwhite specialty," says Danny Grizzle of Satterwhite. "It is common for all builders to flip plans left to right, but less common for conventional builders to reorient plans front to back." This kind of flexibility is common with log construction — and important when a cabin needs to face a view of lakes or mountains. Danny recommends taking a holistic approach to designing a custom cabin. "Consider not just the view, but also the presentation and approach," he says. Great log home designs should be appealing from every angle, even if they’re optimized toward a spectacular view or feature. Tin ceilings accent the kitchen, with its custom-crafted cabinetry. The owners of this cabin made the most of their site. Large expanses of glass in the cabin’s gable capture a stunning lake view from the great room. Beyond the windows, the extended gable porch shelters a wonderful outdoor living space, complete with a grill and plenty of room for eating and relaxing al fresco. The same gable porch also provides additional protection for the log walls, keeping maintenance low. Another benefit to the extended porch roof is that it shields the interior from excess sunlight, holding cooling costs down and decreasing the color-fading effects of solar rays. Decks cascade down to the waterfront. While poring over floor plans can be inspirational, having a place for your cabin may be the best first step. "Either design a plan for the site, or buy property suitable for the plan," Sam Satterwhite of Satterwhite Log Homes tells his clients. Inside, this 1,640-square-foot cabin offers a U-shaped kitchen with granite countertops and bar and a pressed tin ceiling with recessed lighting. The cabinets, custom-crafted from character woods, contrast with the stone tile backsplash and hammered copper sink. A vaulted ceiling opens the living spaces in this cabin on a lake. 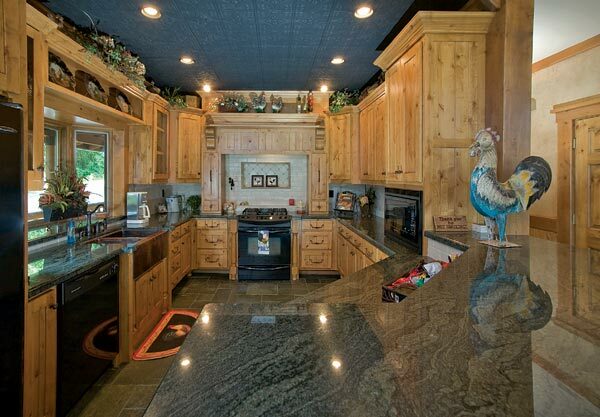 Satterwhite Log Homes has a tradition of using dead-standing timber—trees killed by natural causes—for their logs. The master suite, complete with walk-in closet, bath and access to the home’s first-floor laundry, is positioned behind the kitchen. Upstairs, a second bedroom offers the convenience of an attached full bath. 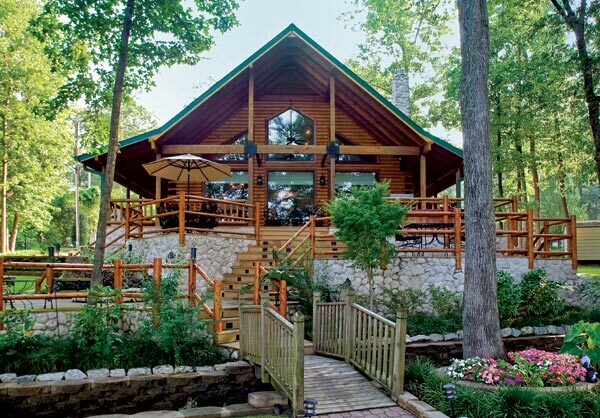 But for this home, and many other cabins, a gorgeous setting makes outside living spaces as important as those inside. The owners planned for a series of cascading decks neatly bounded by rustic log handrails to lead down to the water. They’ve proven that even a small home can live as large as the great outdoors.